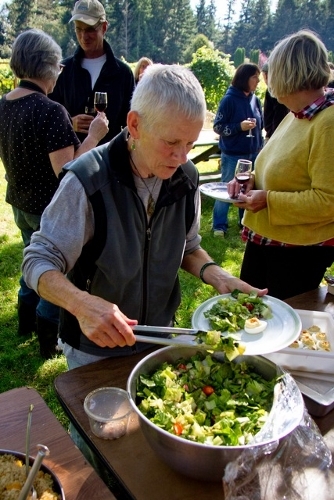 When Whidbey Island Winery called for volunteers to pick grapes, I jumped at the chance to learn more about the potion that has been satiating man’s (and woman’s) thirst for some 8,000 years, meet a handful of new people and – when the work was done – enjoy some tasty vittles. Volunteer Anita McKinley’s expression of rapture perfectly illustrates the mood of the day. 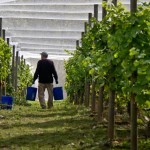 The sun was shining, the grapes were ripe and we were ready, clippers poised, anxious to get snipping. 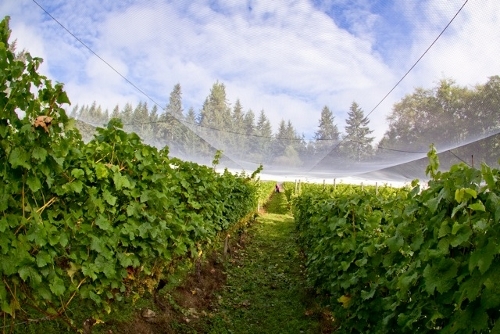 A cover of gauzy netting shades us from the unseasonably warm weather and protects the precious fruits from hungry feathered pests. 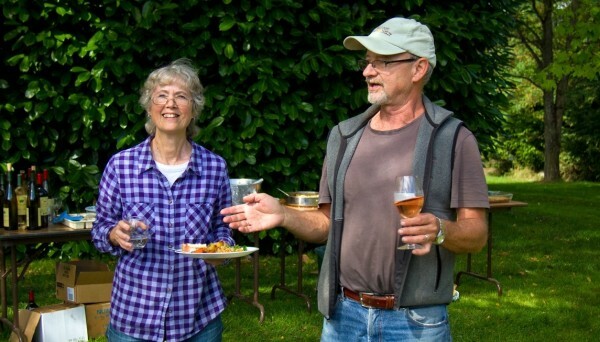 Gregory and Elizabeth Osenbach, owners and operators of Whidbey Island Winery, truck in most of their grapes from Eastern Washington, but grow several acres of their own – some at the winery property on Langley Road in Langley and some at a leased acre on nearby French Road. 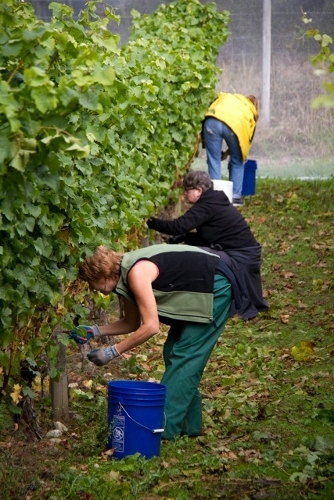 Bunch by bunch, bucket by bucket and row by row, here I am harvesting sweet German Siegerrebe grapes destined for the winery’s limited vintage estate Siegerrebe. I learned that the dusting of gray botrytis mold on some of the magenta-hued globes doesn’t render them useless. Instead, in the mysterious ways of mold, this “noble rot” concentrates the sugars in the grapes for a sweeter end product. 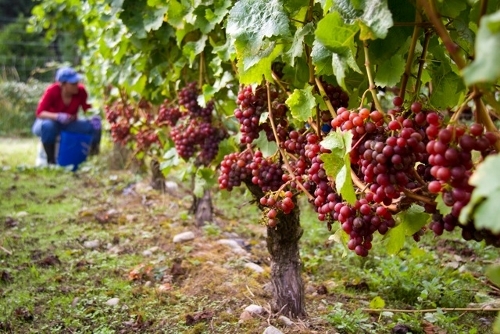 The Osenbachs, Whidbey Island wine producing pioneers, found that the sandy soil of the French Road vineyard and temperate Whidbey climate combine to provide perfect growing conditions for the Siegerrebe grapes, as well as French Madeleine Angevines used in the winery’s most popular vintage, the estate grown Island White. “Do you hear that,” Elizabeth asks as she takes a break from harvesting to show me around the vineyard. This hands-on passion for winemaking started with a “make wine at home” book and grew into a 3,500 case-a-year business. New friendships are formed and old ones rekindled amid the two dozen volunteers, some from as far away as Seattle. 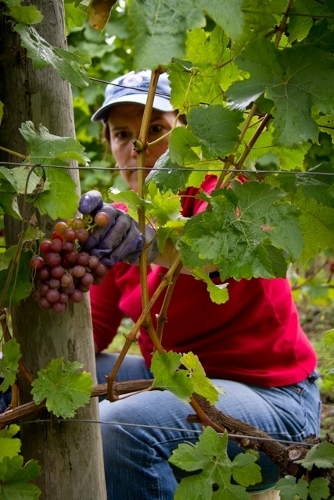 Marti Murphy, with 22 years’ experience slinging grapes for the winery, shows everyone how the job is done. 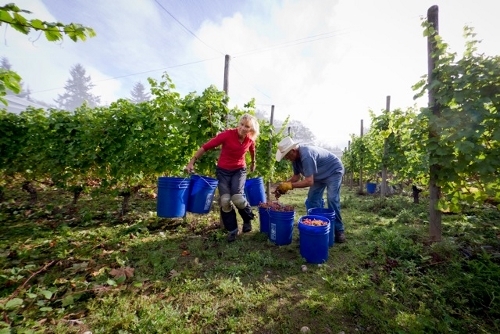 Her infectious enthusiasm never wavered, whether she was clipping grapes, hauling three and four buckets at a time or advising novice pickers. 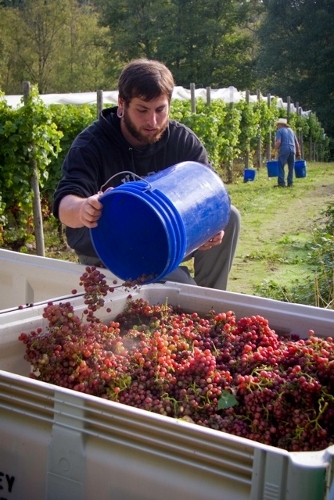 Winery employee Sean Karamanyan loads the newly harvested grapes into a bin for transport to the winery, where the harvest could finish the journey from vine to wine. When every last grape is in the truck, all of us head back to the winery to wash our hands – and the sticky buckets – and relax at the picnic tables already set with lunch. As a thanks for our labors, we are treated to a hearty luncheon made by the Star Store’s very own culinary virtuoso, Kathy Patterson. The menu for the afternoon consisted of roast pork and Brussels sprouts, squash and brown rice, mixed-green salad and loaves of rustic bread – accompanied by plenty of Whidbey Island Winery wines, of course. The day of sunshine, the company of others and a fabulous meal (and plenty of wine) blended together perfectly to create a pleasurable time for all of the volunteers. 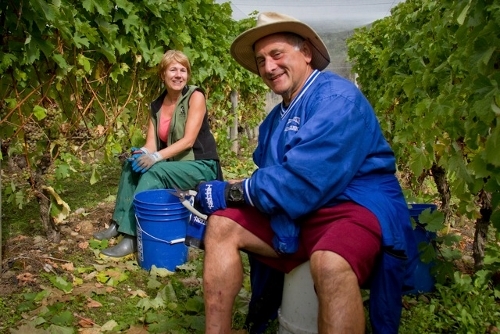 After almost 30 years, the Osenbachs still find this same joy in growing grapes, making fines wines and sharing their love of the business with the community. Whidbey Island Winery’s tasting room, located at 5237 Langley Road in Langley, is open 11 a.m. to 5 p.m., Wednesday through Sunday. Visit the website or call 360-221-2040 for more information. 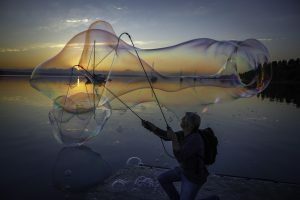 My thanks to David Welton, Whidbey Life Magazine photographer, who expertly put into pictures what I can’t put into words. Food writer Susan Wenzel believes in the power of locally produced food to fortify the health and wellbeing of both the individual and the community as a whole. What a great story! I remember my years, long ago helping out at harvest. It was a lovely sunny day, we all were tired by the end, but the food and friendship were well worth the labor. Arthritis keeps me out of the vineyard to save my wrists for other work, but I think fondly of that day, not to mention the food. What a memorable day and you captured it perfectly – great story and wonderful photos. Kudos to you both and Greg & Elizabeth for letting us all “play” in their vineyard. That’s not a scarecrow. That’s a scarecarrot!